Before the rest of the world, JB-POWER “MAGTAN” came out on the market after having being researched and developed in 1995, and successfully produced on a commercial basis in 1999. As its name represents, the wheel consists of high strength magnesium alloys which were warm-forged by 8000 tons of gigantic oil hydraulic press machine, and weights about two thirds (67 percent)of aluminum. The rim is forged with warm-rolling technique and finished for form-turning with a high performance numerical control (NC) machine. The “MAGTAN” is the masterpiece of wheel that is made with all existing cutting-edge technologies. Today, “MAGTAN” is chosen by our working team Kawasaki and Suzuki, and its high-performance has been proven in the world prestigious motorsports scene, such as MotoGP World Championship and World Superbike Championship. The powerful JB-POWER “MAGTAN” improved the drivability with excellent rotating capacity, followability on the road, braking energy, and improved fuel consumption, which is beyond the realm of our experience. 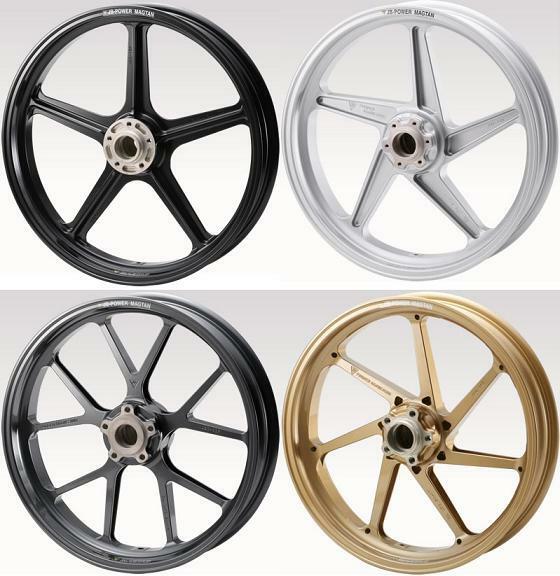 Further, the development of a new material (AZ80) and the technologies of heat treatment and corrosion control enhanced corrosion resistance, impact resistance and absorption property, making it possible for the wheel to last practically forever at regular use. This dream wheel is; “Ultra-Light” “Ultra-Rigid” “Ultra-Precise presets,” upgraded with a high-technology manufacturing. Its elegant design will be passed on to all users with full of new excitements.